Disagreeing with the London Underground Map — Informing Design, Inc.
What could be more sacred to transit map enthusiasts than the principles behind the design of the “Tube Map” of the London Underground? The tangles and confusions of the old map were swept away by Harry Beck in 1931 into a violently not-to-scale, ultra-streamlined simplification. Compared with their previous system map, this is a huge improvement. You can actually read which routes go where, for the most part – something that was hardly possible before. But what if you wanted a transit map that seamlessly meshed with an online “slippy” map (like Google or Apple maps): would we then be doomed to a hopelessly unreadable complexity by being true to geography? The consensus in the world of design says yes, but Informing Design did not assume so. Getting to our current result was not easy; it took a decade of study and experimentation. What you see below is the fruit of all that work: a true-to-geography solution to mapping Downtown Pittsburgh transit routes (not including rush hour express routes and a few neighborhood circulators). Feel free to go to our test site to see it working online at multiple zooms. Simple, eh? What’s the secret? Structure. We force the complexity of the system to "behave" as an eminently readable structure of color-coded families of radiating routes (based on the Wayfinder Sign colors we developed for Pittsburgh), with thickness of line indicating relative frequency of service. In fact, because the map is largely true to geography, it is able to mesh seamlessly with on-line slippy maps, and we are also able to show much more here-to-there detail without losing simplicity. You see the City’s hot spots (in hot pink) and the major parks (in green, of course), and instantly how they relate to bus routes. As you zoom in, road names appear along major stretches of routings. 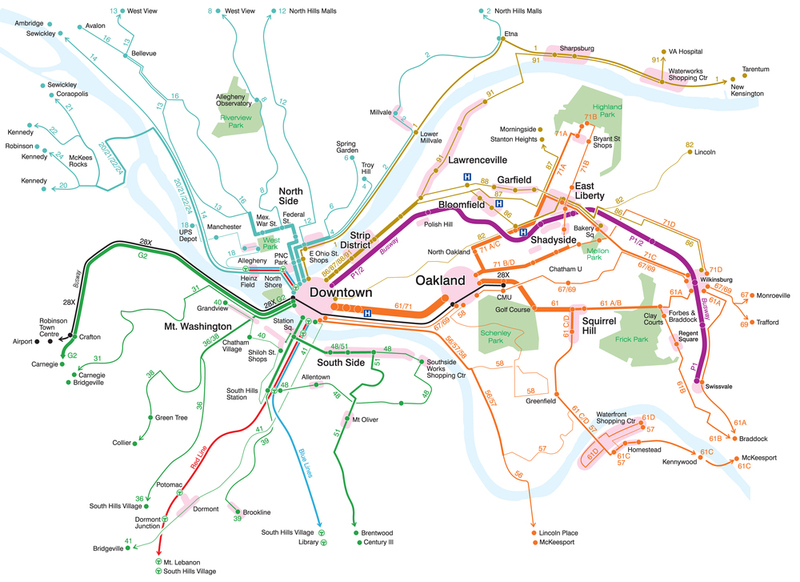 And when you finally zoom in on street details (a feature in our upcoming app, including blow-up details of Downtown and Central Oakland), the transition will be smooth and obvious because you will have been viewing the transit system within a recognizable Pittsburgh topography the whole time. The result? We think this pair of maps will enable someone completely new to the City to guide themselves faster and more accurately than by relying on an automated transit routing solution. And it will be working in a way that can’t help but be more satisfying . . . via an instantaneous self-mastery of the system! How can you get your hands on these maps? Be patient . . . we’ll be showing off our “timetable of the future” app later this year.